Western blot analysis of extracts from COS cells untreated or TPA-treated, using Phospho-Bad (Ser112) (7E11) Mouse mAb (upper) or Bad Antibody #9292 (lower). 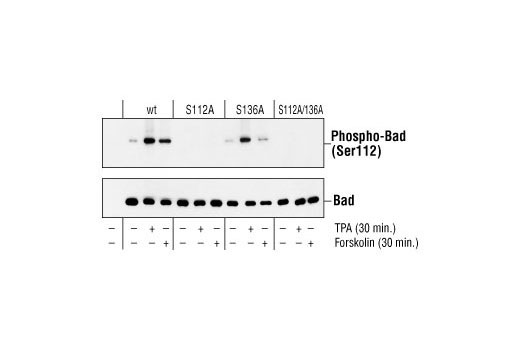 Western blot analysis of extracts from 293 cells transfected with Wild-type Bad, Bad (Ser112A), Bad (S136A), Bad (S112A/S136A) and treated with TPA or forskolin, using Phospho-Bad (Ser112) (7E11) Mouse mAb (upper) or Bad Antibody #9292 (lower). 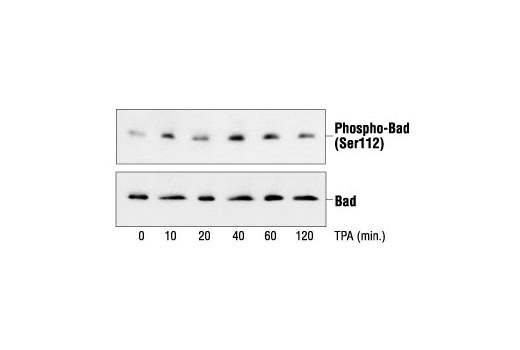 Phospho-Bad (Ser112) (7E11) Mouse mAb detects endogenous levels of Bad only when phosphorylated at serine112. The Ser112 nomenclature is based upon the mouse sequence. The analogous phosphorylation site is Ser75 in human and Ser113 in rat. This antibody does not detect Bad phosphorylated at other sites, nor does it detect related family members.